Drama, it seems like so many people have this in their life. There is at least one family member that likes to stir the pot and create drama. I find it exhausting and totally unnecessary. It makes for a good movie, however if drama is taking over your life in a negative way, it is totally destructive. Life should be full of adventure, passion and interesting things but when the sea gets stormy and the tempest emerges, watch out! The expression drama queen is from people who like to be the center of attention and create a scene. It disrupts the flow of peace, tranquility and robs you of being centered and balanced. 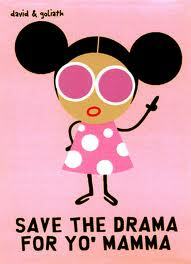 Do we need any drama in our life? I for one do not. I love my peaceful world without any storms. Yes, there will be times in life that are difficult, stressful and challenging but drama will only put fuel to these situations and make them seem so much worse than they really are. Drama is an addiction. So save the drama for the mama. Mama says stop the drama and find some karma! This entry was posted on Thursday, June 14th, 2012 at 12:00 am and is filed under Art of Thinking. You can follow any responses to this entry through the RSS 2.0 feed. You can leave a response, or trackback from your own site.